Elyse Schmidt, 16-year-old flutist, Junior Idiopathic Arthritis sufferer, best friend of Kath, and forever but from-afar lover of Josh Harris, did not love Paris. She barely even liked it. But when your high school band is going to Paris, and you’re a part of it, you go, no matter the consequences. In this case, the consequence is a plane crash. On the way home from Paris, Elyse’s Airbus dives into a mountain, killing almost everyone on board. Elyse and her seat partner, Josh Harris, are the only ones who survive. This book is a study, a narrative, a poem of what life means when you have to deal with the guilt and the pain of being a “survivor.” Why do Elyse and Josh Harris (only ever spoken with both names, because that name encompasses his whole persona, always and forever) live when everyone else dies? What does it mean? What are they meant to do with these lives they are given? All of these are questions Elyse can’t answer, and neither can her parents, her doctors, the loving but invisible presence of Kath, or even Josh Harris himself. Rivers’ prose is beautiful, both teen-friendly and artistic. The settings of the plane, Wyoming (Elyse’s safe place), and Elyse’s thought processes are vividly imagined. The landscapes, characters, and situations with which Elyse must interact come to life, both easily identifiable and creative. This story is unusual, told in second person, which makes it original and interesting. This format may at first may seem daunting; however, the narrative flows smoothly and draws the reader in with gentleness. Second-person storytelling works with this book in a way that fits snugly, like it was made for this character and her circumstances. It’s hard to even imagine the story told in first or third person. Trauma comes in many forms, and we in our society and our art are only recently learning how to deal with it in ways that are ultimately helpful. This story of a survivor feels relevant in a time when trauma of various kinds is being brought into the light in ways unfamiliar to past decades. Rivers’ story of a survivor, a girl trying to figure out her place in the world, feels necessary and helpful in our current climate. Elyse’s world is heartbreaking and lovely, terrifying and quiet. Readers who enjoy books with deep meaning, shifting understanding, and gentle humor will find much to love about this book. 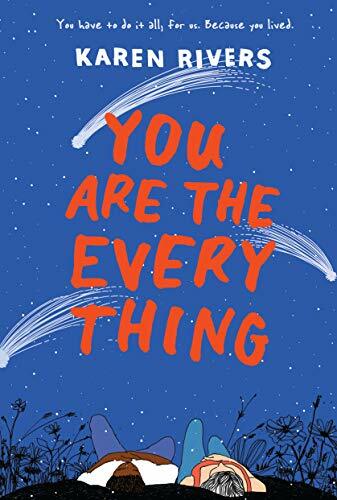 Highly recommended for teens who have either suffered a trauma or know someone who has, adults who are trying to understand the young people around them, or anyone who simply likes a well-told, beautiful story.